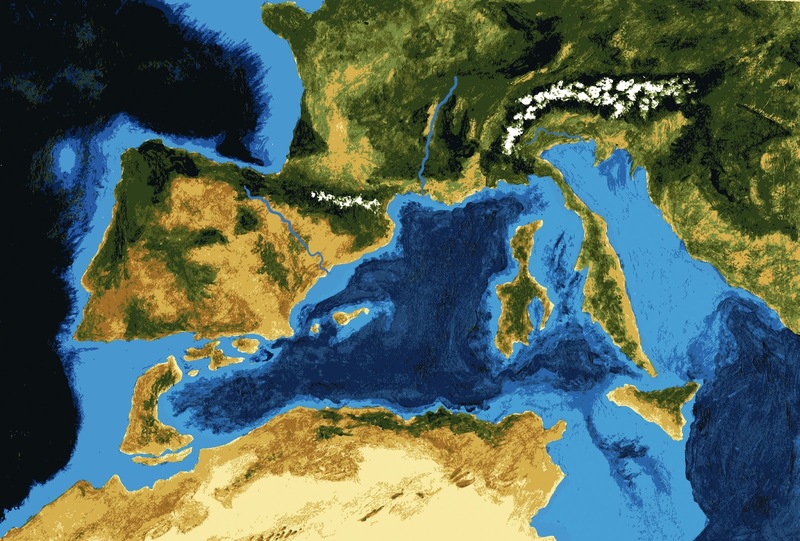 The animation shows the salinity crisis of Messiniense in the Mediterranean Sea, that took place in the Miocene geological era, characterized by the accumulation of masses of salt on its bottom and probably including a period of almost complete desiccation. A possible cause of the subsequent closure of the connection with the Atlantic is the removal of plaque collapsing (slab rollback) during a phenomenon of subduction in combination to the change of sea level. Following the complete closure between the Atlantic Ocean and the Mediterranean Sea the level of the Mediterranean Sea dropped rapidly just because there was no supply of water coming from the Atlantic. The rivers that flowed into the sea, began to run the seabed creating deep ruts and waterfalls in its delta. The evaporation produced the storage of large amounts of salt on the sea bottom. Presumably, during the period in which the level of the Mediterranean Sea was 1500-1200 meters lower than today, some mammals passed through Africa and Europe, through the present Gibraltar Strait. It is believe that the crisis saline, ended with a flood of enormous dimensions of the Atlantic in the Mediterranean Sea 5.33 million years ago, through an passage opened in the current Straits of Gibraltar. When the strait collapsed to the level of the sea, the Atlantic overflowed in the Mediterranean Sea and the water, the erosion due to the waters dug a groove getting bigger, finishing the filling process catastrophic, that lasted only few months.